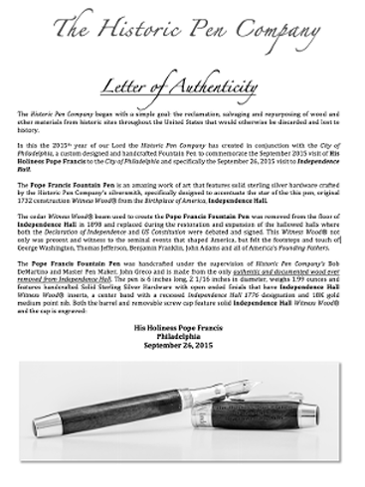 Philadelphia, PA - 12:00pm - Today at Independence Hall, History Salvaged, LLC, announced an exclusive collaboration with renown Miniature Artist Karen Libecap, for the development and creation of a high end line of historic, genealogical and personal heirlooms including but not limited to pens, cufflinks, jewelry and other items, thus enabling History Salvaged to continue offering its customers rare, unique, cultural and historically significant gifts and heirlooms that "Keep History Alive". By creating and painting one of a kind pieces of fine art presenting historic figures, buildings (like Independence Hall) and scenes on the caps of History Salvaged pens that feature historic Witness Wood®, History Salvaged and Karen Libecap make available rare and unique pieces of historic and functional art to the discerning collector, history buff and/or aficionado. 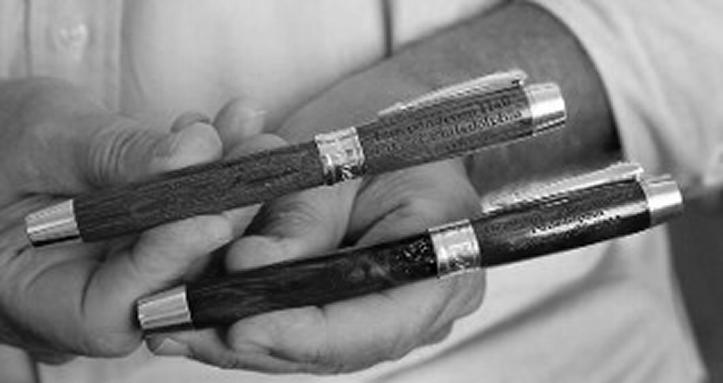 Additionally, History Salvaged will be accepting commissions for not only their historic Witness Wood® pens, but the new "Build a Pen®" program, whereby clients can select from custom pen designs and provide personal images that will be painted by Karen and handcrafted into heirlooms that can be passed down to future generations. "Karen is an amazing talent! 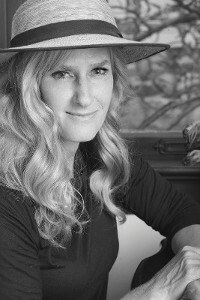 The fact that she has agreed to work exclusively with History Salvaged in the creation of historic and family heirlooms by adapting her unique talent to create fine art miniature paintings on our historic Witness Wood® and other pens, makes available to our respective clients new and exciting heirlooms and gifts" said Bob DeMartino, Founder at History Salvaged, LLC,. 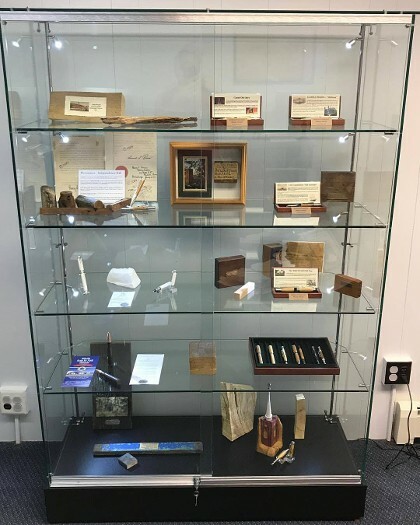 Founded in 2012, History Salvaged, LLC, is the worldwide leader in acquisition of historic Witness Wood® (History Salvaged trademarked description cornerstone of their business) and the creation of luxury fine writing instruments featuring culturally and historic Witness Wood®. Philadelphia, PA — February 19, 2019 — Today at The Constitution Center, History Salvaged, LLC announced an exclusive collaboration with artisan knife maker Rick Simpson & Palmetto Blades of Due West, South Carolina, for the development and creation of a line of historic, heirloom and collectible handcrafted knives, thus enabling History Salvaged to continue offering its customers rare, unique, cultural and historically significant gifts and heirlooms that “Keep History Alive”. By creating handcrafted individual premium quality knives that feature historic Witness Wood®, History Salvaged and Palmetto Blades will make available rare and unique pieces of historic and functional art to the discerning collector, history buff and/or aficionado. “We are honored to be collaborating with History Salvaged on this project. By adding their rare collection of historic Witness Woods® to our handmade custom knives, we will create one-of-a-kind Palmetto Blades that will be the highlight of anyone’s collection.” Said, Rick Simpson of Palmetto. “Ricky has been fortunate to be able to combine two things he loves into a business, history and knife making! 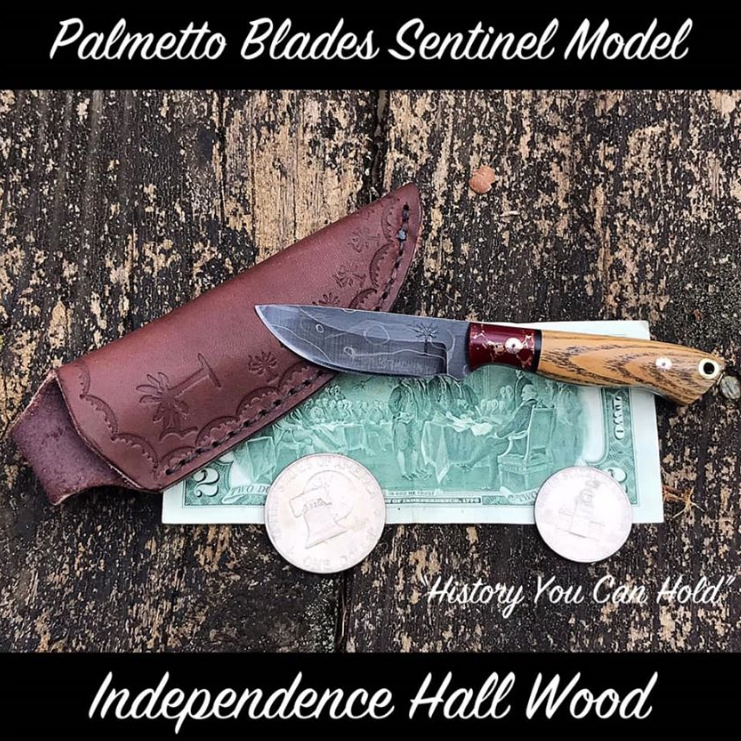 We are proud to work exclusively with Palmetto Blades in the creation of these historic heirlooms, by adapting their unique talent with our historic Witness Wood® we can provide our respective clients new and exciting product,” said Bob DeMartino, Founder at History Salvaged, LLC. 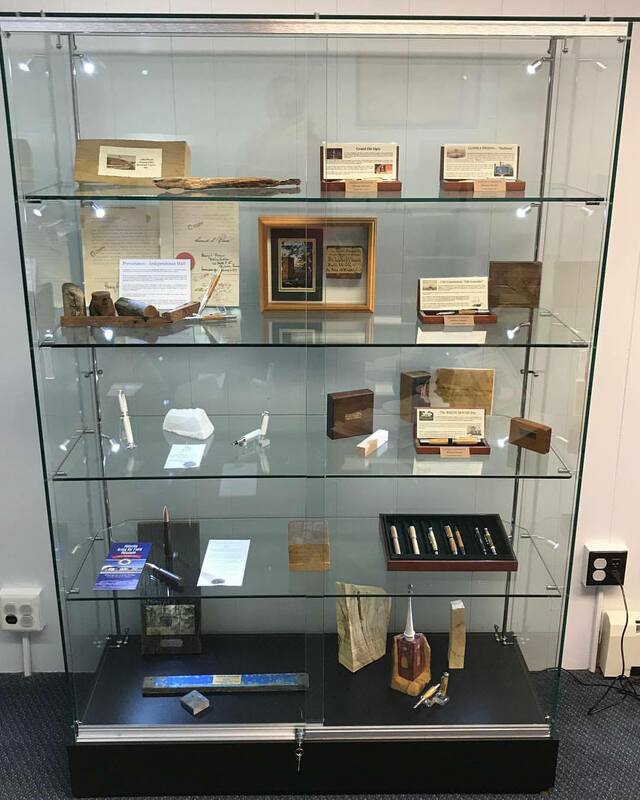 Founded in 2015, History Salvaged, LLC is the worldwide leader in acquisition of historic Witness Wood® (History Salvaged trademarked description and cornerstone of their business) and the creation of luxury fine writing instruments featuring culturally and historic Witness Wood®. Bob DeMartino is used to dealing with historic figures, and historic materials. History Salvaged says it’s turned original wood from Philadelphia’s Independence Hall — wood removed in an 1897 renovation — into items “that once felt the footsteps ... of George Washington, Benjamin Franklin, Thomas Jefferson” and more American legends. He’s also made memorabilia from wood that came anywhere from Abraham Lincoln’s birthplace to Atlantic City’s Boardwalk, as planks ripped up in Hurricane Sandy. 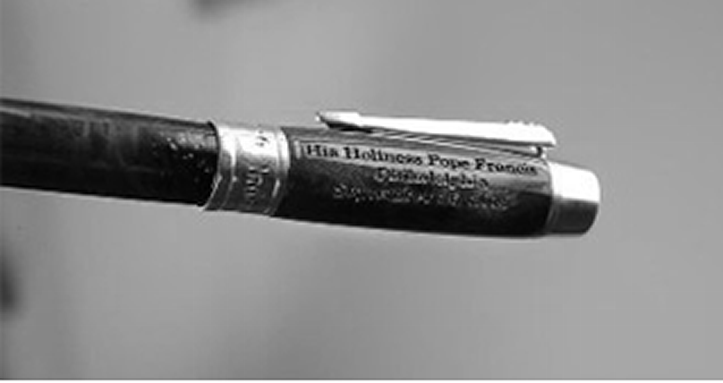 And now DeMartino is dealing with a whole different sort of historic humanity: He created a pen out of that Independence Hall wood for Pope Francis, to honor the pope’s visit to Philadelphia this weekend. The company actually made a pair of “sister” pens for the occasion out of wood documented to be recovered from the building where America was born. One is for the celebrated visitor from Rome; the other is for his host city to keep, probably in the Philadelphia History Museum. 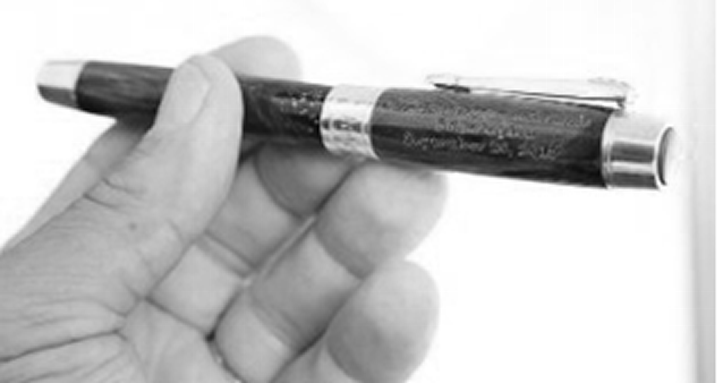 And although many businesses are working to capitalize on this papal visit, DeMartino won’t make a penny from his pens, which combine silver hardware with their precisely engraved, highly polished, history-soaked wood. They are his gifts to the Vatican and the city. DeMartino, who runs his company from his West Creek home, delivered them Thursday. He took the one personalized for the Pope to the Pennsylvania Convention Center, the sprawling headquarters of this week’s World Meeting of Families, the event that drew the Pope to Philadelphia. DeMartino brought it to a room where officials are collecting gifts presented for the Pope; he hopes his offering will find its way to the Vatican’s archives as a relic of this visit. But he’s still not sure of that. He came up with the idea to present the pope a piece of Philadelphia’s past shortly after this visit was announced — which wasn’t long after DeMartino got his hands on those ripped-out remnants of the home of the Declaration of Independence. The history buff and entrepreneur had learned about this wood in old newspaper stories, and had been trying for several years to buy some. When he finally did, “I’m sitting here with this Independence Hall wood, and the pope is coming to Philadelphia,” DeMartino remembers. But when he approached the city and the Archdiocese of Philadelphia about his plan, he got the same answer: The Vatican was actively discouraging gifts for the pope. DeMartino, a Catholic who goes to church at St. Mary of the Pines in West Creek, persisted. When Philadelphia Mayor Michael Nutter’s office first put him off, DeMartino went to City Councilman Mark Squilla — whose district includes Independence Hall. “I figured he’s Catholic, he’s Italian. He got back to me in five minutes,” DeMartino said. “I thought it was a neat idea. It’s part of Philadelphia, and part of history,” said Squilla, who put DeMartino in touch with the right people in the administration to say the mayor could present a pen to the Pope. After some back-and-forth, they sounded interested, so DeMartino told one of his craftsmen to start creating and engraving. Then on Tuesday, DeMartino was on his way into Philadelphia, taking a neighbor to a hospital for surgery. He was on the Ben Franklin Bridge when he got a sudden call from the mayor’s office — asking him if he could bring the pens to Philadelphia by 1 p.m., because the mayor could give a few gifts after all. But DeMartino didn’t have the pens with him, and he couldn’t get home and back to the city by that deadline. So he made his delivery Thursday. He got an official receipt, and he hopes the Pope will at least see or hear about his pen — not that DeMartino ever had high hopes about it becoming some personal papal property. DeMartino can document the history, or provenance, of the wood for his papal pen back to Samuel Reeves, Independence Hall’s superintendent during a renovation and expansion project in 1897. Some of the discarded floorboards and handrails were churned out into souvenirs for major American anniversaries, such as 1876 and 1976. And the latest owner had the leftover wood stored in a barn on New York’s Long Island. But both the owner and that lumber, which dates back to Independence Hall’s 1732 construction, were aging. Then as soon as he got the historic wood, he heard about a bit of modern history hitting Philadelphia, right down the highway from his home — and just down the street from Independence Hall. Through acquisition, History Salvaged, LLC has added the only documented Original Construction Witness Wood® removed from Independence Hall to its inventory! Independence Hall is arguably the birthplace of the United States of America, home of the Declaration of Independence, the US Constitution and the Liberty Bell. This Independence Hall Witness Wood® includes pieces of beams that supported the floor when both the Declaration of Independence and the Constitution were debated and signed. These Independence Hall Witness Wood® beams and railings that had once felt the footsteps and touch of George Washington, Benjamin Franklin, Thomas Jefferson, and John Adams, among others, were torn up as part of a renovation in 1898. 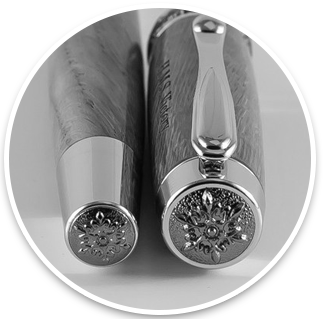 Fortunate to find and acquire the wood, we are developing a Limited Edition series of heirloom quality, precious and semi-precious metal fine writing instruments and cuff links that will present this historic Witness Wood® with the reverence and respect that it deserves. Completed in 1735 it took two years to build Independence Hall home of the 1st Continental Congress and the Declaration of Independence and where the Constitution was debated and put to paper. 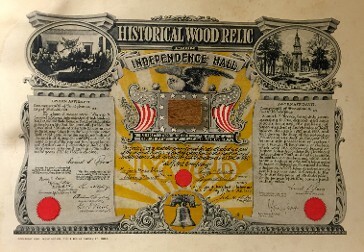 In 1912 Reeves sold the beams to John S. McQuade a builder and member of the Philadelphia City Council for the purposes of cutting them up and making “relics”, but McQuade stored the beams for 12 years and in 1924 sold them to two brothers Walter and Clarence Deisroth owners of a paper box company in Philadelphia. The Deisroth’s reduced some beams to 100,000 slivers and sold them as souvenirs during the Sesquicentennial Exposition of 1926. In 1956 the Deisroth’s company went into bankruptcy and at auction Mr. Henry Gouse a retired sales engineer and the Mid-Atlantic Tennis Champion of the 1940s bought the wood at auction. Along with what was left of the timbers thousands of chips and 20 gallons of sawdust, byproduct of producing the 100,000 slivers was included in the lot . 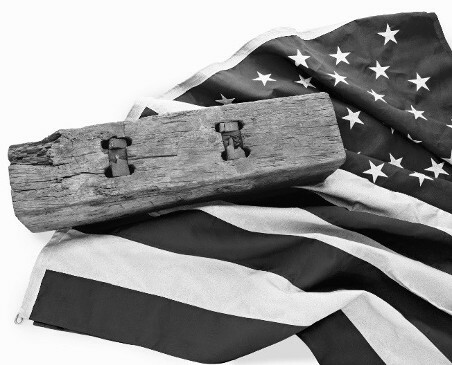 Grouse stored the beams in a barn on his property on the outskirts of Philadelphia where he made gavels out of some of the beams and presented them over the years to: President Eisenhower, President Nixon, Winston Churchill, Charles de Gaulle and other political leaders. Grouse also gave 4 of the beams to Independence Hall and the National Park Service, confirmed in National Park Service letter acknowledging “the gift”. In 1975 Gouse was in his 80’s and his ex-wife “reluctantly” sold the remaining woodpile to an artist and attorney from whose estate we have been able to acquire the remaining Witness Wood®. Mrs. Grouse only sold the Witness Wood® because of the high cost of living and her economic situation, she simply could not longer afford to keep the timbers and sold the Witness Wood® with the understanding that it would not be desecrated. The new owners subsequently cut up most of the remaining wood again into slivers, producing thousands of history cards and memorabilia that were sold during the Bi-Centennial in 1976 all over the country and in many major department stores. The remnant wood has remained drying out and deteriorating in storage since the 1970’s until our recent acquisition.